There a few stocks I’ve consistently been bullish on for the past few years. And then there are also a few stocks which I’ve been consistently bearish on for a few years. Starbucks (NASDAQ:SBUX) stock falls in the latter category. I always looked at Starbucks stock as a case of a slowing growth story converging on a premium valuation. For the past few years, that has resulted in a sideways stock. But eventually, I predicted that the slowing growth story would cause the premium valuation to fall out, and Starbucks stock would drop. That big drop finally materialized over the past month. Weak numbers and key executive departures plunged Starbucks below $50. And I, the long-time bear, think it is time to buy the dip. Why? Starbucks is the gold standard in the retail coffee game, and that does guarantee it stable and healthy long-term growth prospects. Below $50, those growth prospects aren’t fully priced in. For the past two-plus years, Starbucks has been stuck in a sideways trading pattern. The stock has bounced between the lower-$50’s and mid-$60’s, but never really gained any ground, as slowing growth battled the stability that comes with a strong global brand. That sideways trading pattern was broken recently. Slowing growth bested stability. Management gave an ugly update on third quarter numbers that underscored the slowing comparable sales growth narrative. The unit growth narrative is expected to weaken, too. And long-time Starbucks king, Howard Schultz, announced his departure from the company. The rush of negative news caused Starbucks to drop below $50 for the first time in 3 years as investors began to re-price SBUX stock for an era of slower growth. In that era, Starbucks doesn’t dominate the retail coffee game. They are simply the biggest player in a crowded space that includes price-first options like McDonald’s (NYSE:MCD) and trend-first options like Peet’s Coffee. Because the stock has dropped so much, I have been forced to relinquish my bear thesis. My whole bear thesis was predicated on the idea that SBUX stock wasn’t priced for permanently slower growth going forward thanks to beefed up competition. But now, SBUX stock trades at just 18-times forward earnings, versus a 5-year average forward multiple of 26. That is a substantial 30%-plus discount to normal valuation. The 18 forward multiple is also more in-line with market-average multiples. The market-average forward multiple is 16, while the growth-average forward multiple is 20. SBUX stock is square in the middle of those, and that feels about right. Beyond relinquishing my bear thesis, I am also building a bull thesis on Starbucks stock here and now. Below $50, Starbucks looks compelling. Growth is slowing, yes, and Starbucks will never again dominate the coffee retail game to the tune of 5% and up comparable sales growth. But, Starbucks is still the gold standard in coffee retail. The company name is essentially synonymous with coffee (let’s go grab a coffee is often swapped out with let’s go grab Starbucks). The menu remains fresh and exciting. Everyone has their favorite Starbucks drink. The unit growth narrative in China remains promising. Margins are stable. Moreover, the brand is globally recognized and admired, and the company has locations everywhere, giving them a physical presence that is second to none in coffee. Overall, this is still a really good company with global reach, stable profitability, and healthy long-term growth prospects. At 18-times forward earnings, those long-term growth prospects seem undervalued. While the era of 5%-and-up comparable sales growth is dead and gone, we also aren’t heading into an era where comparable sales growth will be negative and margins will compress. Comparable sales growth will still be positive, just in the 0-2% range, and margins will stabilize and/or head higher thanks to price hikes. Overall, given mildly positive comparable sales growth, international unit expansion, and margin stabilization, Starbucks is a company which can grow revenues around 7% per year and maintain an operating margin profile in the 20% range. Under those modeling assumptions, Starbucks should be able to net $3.60 in earnings per share in five years. A growth-average 20-times forward multiple on that implies a four-year forward price target of $72. Discounted back by 10% per year, that equates to a year-end price target of $54 for Starbucks stock. Beyond the fundamentals, the technicals also say buy now. The Relative Strength Index (RSI) is deep into oversold territory, and is as low as it has been over the past 5 years. Also, the stock has fallen basically 15% below its 200-day moving average, the farthest it has been below its 200-day over the past decade. I haven’t liked it for two years. But now that it is finally below $50, I like Starbucks stock. Long-term growth prospects remain healthy, and while the era of 5% and up comparable sales growth is over, Starbucks doesn’t need 5% comparable sales growth to support a price tag above $50. As such, I expect Starbucks to rebound towards the mid-$50’s by the end of the year. As of this writing, Luke Lango was long SBUX and MCD. 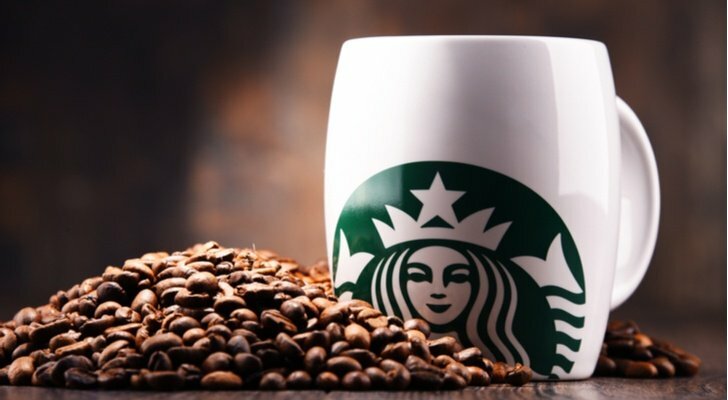 Article printed from InvestorPlace Media, https://investorplace.com/2018/07/starbucks-stock-buy-this-dip/.